Sticking with the A-Z archive theme today, here is a photo of Ocean City, New Jersey. Ocean City is known as a family friendly seaside resort and in 2005, the Travel Channel rated it as the Best Family Beach. One of the reasons it is family friendly is that the sale of alcohol is banned in the city limits. We went there last summer for a friend’s wedding. The photo shows the view from our hotel window. Unfortunately we didn’t have a view of the beach, but I enjoyed seeing the houses. It looked like a cute town and you wouldn’t know that it is not that far from Atlantic City, which I’m guessing doesn’t win too many best family awards, but I could be wrong. This week’s letter for Frizztext’s A-Z archive photo challenge is O. Feel free to join the fun! This entry was posted in Travel, Travel Photos and tagged Beaches, Cities, Families, Family Friendly Resort, New Jersey, Ocean City, Photos, Seaside Resorts, Travel, Travel Blog, Travel Channel, Travel Journal, Travel Photo, United States. Bookmark the permalink. Actually AC is pretty family friendly according to my daughter. Her best friend’s parents go there all the time and frequently take the girls. While the parents are gambling the girls go to PG rated shows, get room service, and hit the beach. That is good to know. I remember when I was a kid and we would go to Vegas for soccer tournaments. This was before Vegas was redone and it was horrible for kids. The only thing for a kid to do was go to Circus Circus and none of us on the team really liked it. We would hang out in the rooms and watch movies. And we went every year. When I went back to Vegas years later I was amazed by the transformation and all the stuff for kids to do. And having a beach in AC is a big draw. I found the boardwalk a little depressing at night though. I was surprised by that as well. It looked like a town from the movies were everything is perfect. I love how you elevate the ordinary! Another great entry and photo! I really like the bridge. It sort of reminds me of a bridge in Astoria, Oregon – but that one is a really long bridge. I haven’t seen that bridge in Oregon. I’ll have to add it to my list! Lovely clean and clear photo! It was a fun place, especially for families. And they had a ton of miniature golf courses–I lost count of how many. Me too! I’m horrible, but I love watching the ball bounce off of everything. The bridge reminds me of one which goes out from or to Lisbon – we drove across it last year, great fun! Lisbon is on my list of places I want to see. I’ll keep an eye out for the bridge! 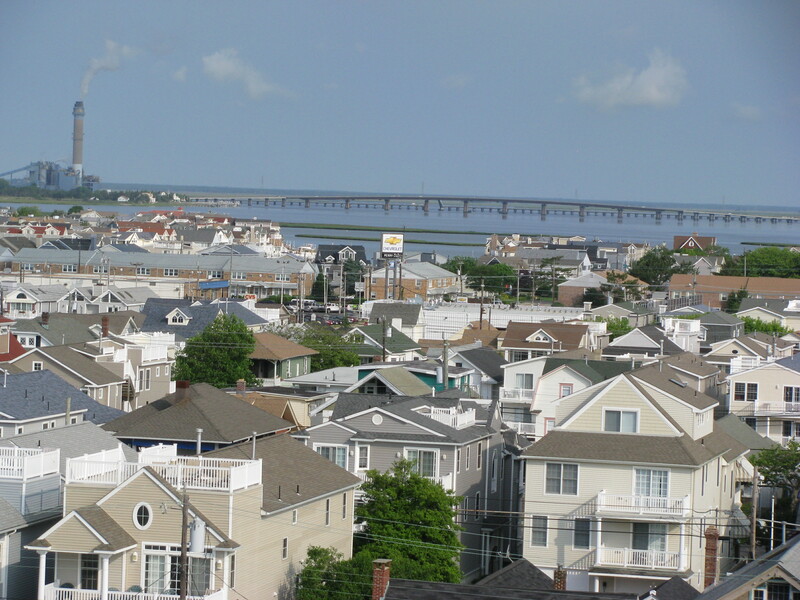 Thanks for the shot of Ocean City…..I DO miss the Jersey Shore! Next time I’m out that way I’ll have to check out Long Beach Island. Sounds perfect and I’ll do my best not to tell anyone, but I can’t make any promises. And I’ll have to remember the restaurants. That bridge adds interest to the image! Thanks…the bridge was why I took this photo.